The is operator determines whether an object is compatible with a particular type. For example, suppose the Employee class is derived from Person, and the Manager class is derived from Employee. Now suppose the program has a variable named user and it must take special action if that variable refers to an Employee but not to a Person. The as Operator returns the object if casting is valid. If casting is not valid, it will return null. On the other hand, is operator returns true if the object is derived from a base class. In a widening conversion, the destination data type can hold any value provided by the source data type. In a narrowing conversion, the destination data type cannot hold all possible values held by the source data type. For example, an int variable can hold integer values between –2,147,483,648 and 2,147,483,647. A short variable can hold integer values only between –32,768 and 32,767. That means converting from a short to an int is a widening conversion because an int can hold any value that a short can hold. A widening conversion always succeeds. Within the checked block, the program throws an OverflowException if the conversion from the int big to the short small fails. A checked block does not protect code inside methods called within the block. For example, suppose the code inside a checked block calls the CalculateTaxes method. In that case the checked block does not protect the CalculateTaxes method if it performs a narrowing conversion. If CalculateTaxes tries to make a narrowing conversion that fails, the program does not throw an exception. Indexed properties, or indexers, behave a little differently from standard properties. The primary purpose of indexed properties is to allow "array-like access to groups of items". ➤ They accept an index value in place of the standard property value parameter. ➤ They are identified through the use of the keyword this. ➤ Indexed properties can be created in classes or structs. ➤ Only one indexed property can exist in a single class or struct. ➤ They can contain get and set methods just like other properties. Arguments -> those variables are passed to method calls. means that the caller must provide required parameters but can omit the optional parameters. In the following method Width is optional, if the caller does not supplied Width then 1 will be used. In the previous example Length is required parameter that must be supplied by the caller. The above method can be called in the following manner. In the parameter declaration, required parameters should be placed in first and then followed by optional parameters. Following code will generate compiler errors since the default parameters are at first. named arguments length: and width:. Note the order of arguments can be different as compared to parameters list. Now if some parameters are not named they must appear first. The following code is valid. Look the other parameter is the first in parameter list. If we put other at the end, we get compiler error. Delegate in C# is as function pointer in C++. However there are some differences between function pointer and delegate. For example delegate supports chaining. Here is a declaration of delegate. Anonymous Functions, a function without name. We can reduce the size of code by using anonymous methods. Let's modify the previous example. //We don't need to have the Add method at all. Sometimes the whole signature of a method can be more code than the body of a method. There are also situations in which you need to create an entire method only to use it in a delegate. Anonymous functions can be further shortened by Lambda expression. We can create lambdas that span multiple statements. We can do this by adding curly braces around the statements that form the lambda as following example shows. Action is generic delegate specified by .NET framework. If we use this we don't need to declare the delegate by ourselves. Func is very much similar to Action. Only difference is that Func can return a value. Following example takes an integer parameter and return a string. Following example takes 2 integer parameters and return a string by using Func. Difference between Func and Action is that in Func the last last one should be return type, in Func there must be a return statement. See the following example. double type is returned, so the second generic parameter is double and the return type of the lambda statement is double. Also note that the result is declared as double. Only one parameter is passed to OwnedFunc and that is int type though in declaration we have 2 parameters. Func is generic delegate that takes up to 18 parameters and always the last one is out parameter. All other parameters are in parameters. For example in the following code, first int is input parameter and second string is out parameter, meaning the return value of the delegate. First myretstring variable is declared as string that will hold the return value of Func. The return value is saved directly to myretstring. Looks how 4 is passed to the Func. Second, we create a Task that return result as string. StartNew takes a Lambda expression which in turn calls another Func with parameter 10. There are quite many ways to create task in C#. Following code sample shows four different ways to create task and task<TResult>. We use task when we don't need any return value from operation. When we use Func then we expect return value from operation. StartNew is the most flexible way. 3 ways to create tasks in C#. Events in .NET framework. Events in .NET are similar to popular design pattern publish and subscribe in many platforms. We can get called when some thing interested happen some where in our code. We can subscribe to an event and then we can be notified when the publisher of the event raises a new event. This is used to establish loose coupling between components in an application. We use delegate and event to accomplished this. Let's design an example, we want to get notified when the balance of an bank account goes below 0. Declare a delegate, return type void and takes 2 parameters source (who fires the event) and eventargs extra information about the event. Declare an event in the BankAccount class. By Overdrawn we can call the method to which OverdrawnEventHandler points. Thread is a unit of execution. By default a thread is foreground thread, a thread can be set to background by putting IsBackground property to true. A process will stops when all foreground threads are stopped. Try the following example by changing the IsBackground property. If it is background then it stops immediately otherwise it continue to run. delegate. The parameter is passed when we start the thread. ThreadStatic attribute, each thread gets its own copy of a field. Meaning if the [ThreadStatic] attribute is not used the field is common to all threads. If the attribute is used then the field is used as local to the thread. With ThreadStatic the first thread get the initialized value and others thread get the field value as 0. The following image shows the output with ThreadStatic and without ThreadStatic attribute. ThreadLocal class takes a delegate to a method that initializes the value for each thread. As compared to ThreadStatic each thread has a unique value. Thread pools are used to reuse threads since creation thread is expensive somehow. One of the important method is QueueUserWorkItem that takes a delegate with a parameter object. 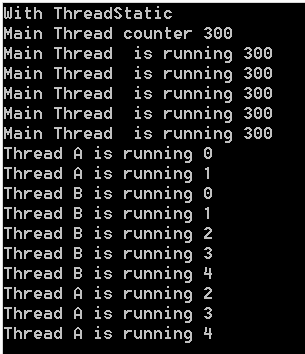 Problem with thread pool is that there is no way to know when the operation is finished or what is the return value. QueueUserWorkItem only takes a delegate or a delegate and an object. The delegate can be also be lamda expression. See the following example. QueueUserWorkItem takes a delegate which takes a parameter of type object. It may take also 2 parameters. Task is an object that represents some work that should be done. The Task can tell us if the work is completed and if the operation returns a result, the Task gives us the result.The Task scheduler uses threads from the thread pool to execute the Task. Another way to start the task is using StartNew method of Task Factory. Here is the modified version of previous example. Note that we don't call the Start() on Task object because StartNew () does that for us. We can execute the Task in separate method. We can use statement Lambda. We can execute the Task in separate method. We can use Lambda expression. Note the difference between statement Lamda and Lamda expression. The first three are expression lambdas because the right hand side of the lambda operator is an expression. The last three are statement lambdas because the right hand side of the lambda operator is a block. This also illustrates that there are three possible syntaxes for the left side: either a single parameter name, or a parenthesized list of untyped parameters, or a parenthesized list of typed parameters. Besides Task, the .NET Framework also has the Task class that we can use if a Task should return a value. // Wait is not necessary since we call the t. Result this block the thread till we have the result. ContinueWith previous task. Task can be chained. When a task is finished we can start new task by using the result of the previous task. See the next example. Continue with overload that can handle faulted or successful situation. Conditionally task can be executed depending on some situation. Child Task: we can build a complex tasks scenario by introducing child task. all three children are finished. Creating task with task factory. Task factory simplified the task creation a bit easier. TaskFactory can be created with certain configuration and then the configuration can be used to create the task. While you use Run () then don't use Start() anymore, the task is already started by Run(). See the following code. Wait all for tasks, we can wait for individual task or wait for all tasks. If we run the following code we see that the code takes around 1 second though we have thread delay in 3 seconds in 3 threads. We can also wait for long running task also. Also notice that the console output is not in any order. Any task can start first, OS will decides. By using WaitAny method we can wait for any method, see also how the completed tasks are removed inside while loop. signals to a System.Threading.CancellationToken that it should be canceled. See the following example how this is used. For loop executes a for loop in which iterations may run in parallel. Below example trying to print 0 to 9 but these number will not be printed in order. We can cancel the loop by using the ParallelLoopState object. We have two options to do this: Break or Stop. Break ensures that all iterations that are currently running will be finished. Stop just terminates everything. See the following example. iteration can also be done in a parallel way. Following listing shows how to do this. execution. Following code shows how to use it, also note that how a method can be used in where clause in parallel processing. BlockingCollection is shown in the following code example. This collection is thread-safe for adding and removing data. Removing an item from the collection can be blocked until data becomes available. Adding data is fast, but you can set a maximum upper limit. If that limit is reached, adding an item blocks the calling thread until there is room. any specific instructions, it uses the ConcurrentQueue by default. Enumerating a ConcurrentBag. The differences between TryTake and TryPeek is that TryTake removes the object from the collection where as TryPeek just return the object without removing it. snapshot of the data. Following listing shows how to use a ConcurrentQueue. to add and remove items, and to update items in place if they exist. 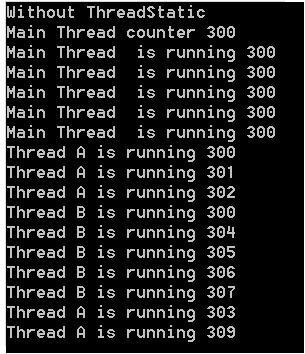 Multithreading problem is shown in the following example. If we run the following example then we see the value of n is different for for each run. On the other hand if the if we have the for loop limit (1000000 to 1000 for example) is small then it works fine. Why? The reason is that if the limit is small then all are executed in without context switch. Previous locking can be solved by using lock block. Following example shows how to use lock. Lock should be private, if it public then other thread may access it. It should also be a reference type because a value type would get boxed each time we acquired a lock. In practice, this generates a completely new lock each time, losing the locking mechanism. Fortunately, the compiler helps by raising an error when you accidentally use a value type for the lock statement. Previous code may causes the threads to block while they are waiting for each other. This can give performance problems and it could even lead to a deadlock, where both threads wait on each other, causing neither to ever complete. Following examples shows how to create deadlock. We need to be careful to avoid deadlocks in our code. We can avoid a deadlock by making sure that locks are requested in the same order. That way, the first thread can finish its work, after which the second thread can continue. //Change the value 1000 to 1 and see it does not create deadlock, why? Volatile class and synchronization. The out of the following code is 5. But sometimes, C# compiler optimize the code. In this case, 2 lines in Thread1 might swap the lines and thus affecting the output. To prevent this we can use volatile keyword. Interlocked guarantees that the increment and decrement operations are executed atomically. No other thread will see any intermediate results. The CancellationToken is used in the asynchronous Task. The CancellationTokenSource is used to signal that the Task should cancel itself. How to know when a task is being cancelled? By throwing ThrowIfCancellationRequested we can know when a task is being cancelled. Following example shows how this can be done. Instead of catching the exception, we can also add a continuation Task that executes only when the Task is canceled. In this Task, we can have access to the exception that was thrown, and you can choose to handle it if that’s appropriate. If we want to cancel a Task after a certain amount of time, we can use an overload of Task.WaitAny that takes a timeout, following example shows it. If ThreadSleepTime is greater that TaskTimeOutTime then we get the return value of WaitAny() as -1. On the other hand if the ThreadSleepTime less than the TaskTimeOutTime then it will be 0 (Task will be completed before the time out ). // Displays: My secret data! GC.Collect ( ); // For release mode GC remove the object and timer is not fired anymore. GetInvocationList gives us the total number of methods in the invocation list. Following list shows how many methods are in the list. Most cases we must follow the signature and return type of delegate. But this is not the case with covariance and contravariance. Covariance makes it possible that a method has a return type that is more derived than that defined in the delegate. Contravariance permits a method that has parameter types that are less derived than those in the delegate type. // for different ways of running our application. // Print the time it took to run the application. // We are simulating an I/O by putting the current thread to sleep. Array to List and List to array. Following section explain how we can convert array to string list and vice versa. // LINQ creating anonymous object from another object.